With the development of smartphones, many apps appeared that can make your phone into a device that is highly helpful in daily life. One of the most popular things people do on their phones is messaging people online using various messenger apps. Because of this, there apps especially developed to help you organize your messenger apps and make your messenger experience more practical. We did our research and we have for you an app for this purpose. Let’s discuss about it. nBubble is highly productive and efficient personalization app developed for all android users that need to make their online messenger texting more organized and simpler. The app offers the users to organize their messenger apps and offering them to view and reply on chats fast without opening the specific messenger app to do that. This notifying tool is working on many messenger apps like Hangouts, WhatsApp, Facebook Messenger, SMS, Email, Gmail, and many other online messengers. This app is easy to use and simply created to help users simplify their online messaging experience. The app takes notifications from messenger apps, organize them and display it to the user as floating icons or chat heads. 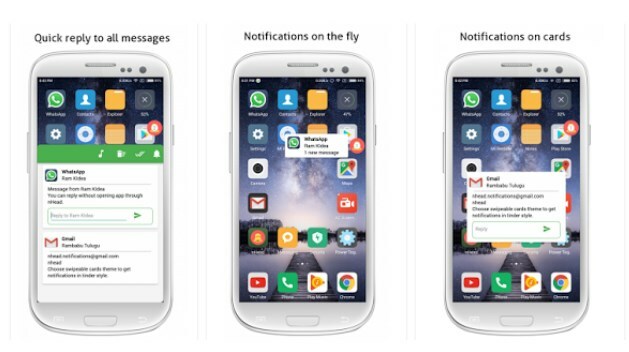 The users receive popup notifications from their messenger apps, even if they use their phone in full screen mode in the moment. Fast viewing and replying on chats, without opening each of the messenger apps individually. The app is allowing the users to open their messages whenever they want. Also, the users can customize the themes and message bubbles on this app by their own taste. The app is offering the users to disable this app for a specific messenger app they use if they need to.